Release the locking tabs on the lens. Remove the lens. Remove the reflector mounting screw. Remove the reflector and grille. The model number is located on the inside edge of the housing. Remove the bulb(s) from the unit. Remove the springs from the hooks inside the rough-in box. 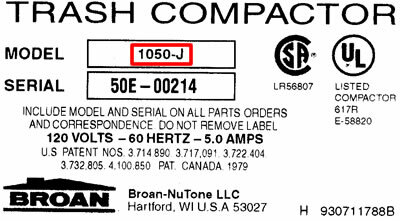 The model number is located on the inside end of the rough-in box. 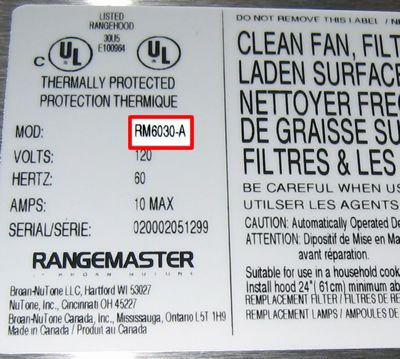 The model label is located either on the right or left side wall of the range hood canopy. 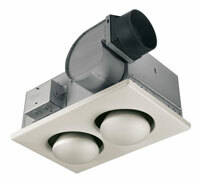 Remove range hood filters. The model label is located on the underside of the canopy behind the filters. 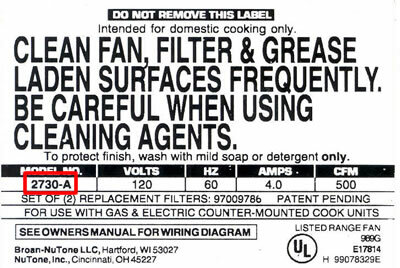 The model label is located on the inside of left wall of the range hood canopy. Filters may need to be removed to access the label. 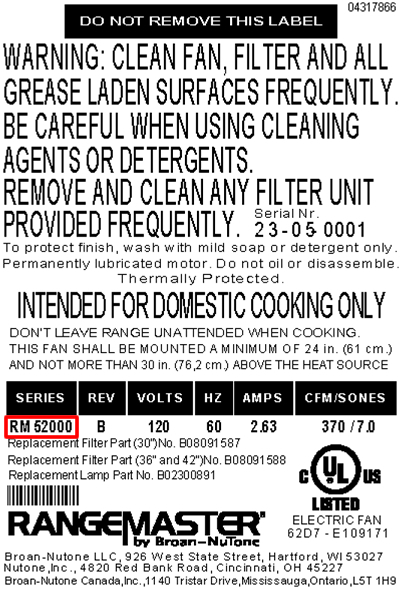 The model label is located on the front of unit beneath the cook top. Cabinet drawers or shelving may need to be removed to access label. Remove the grille by pulling down 2 inches. Reach behind the grille and squeeze the mounting springs to remove the grille. 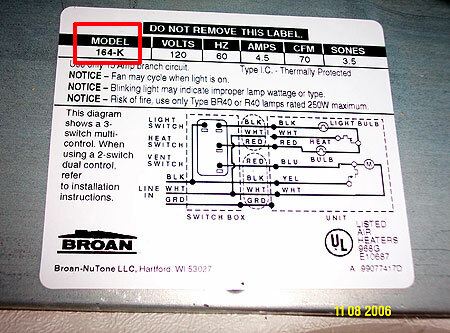 The model label is located in the corner closest to the outlet. 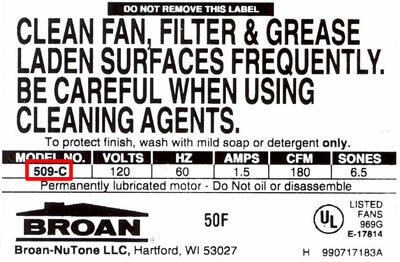 Some fans may have the model stamped into the motor plate instead of a printed sticker label. Remove the grille by pulling down 2 inches. Reach behind the grille and squeeze the mounting springs to remove the grille. 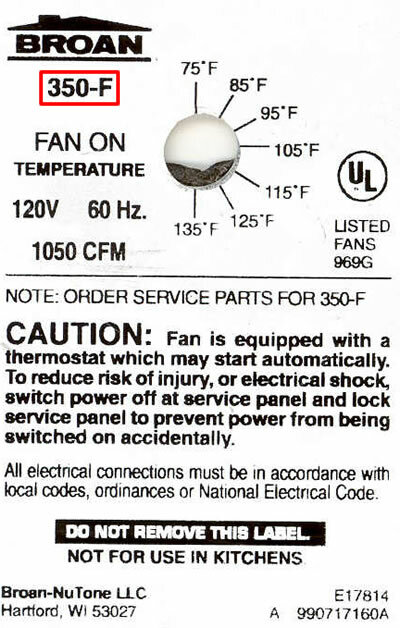 The model label is located on the underside of the motor plate. Remove the glass lens which is attached by two leaf springs. Use a small flat head screwdriver to pry the glass lens from the grille. Screwdriver can be inserted into one of the small slots on the perimeter of the glass lens. To avoid scratching the surface of the grille the screwdriver can be wrapped in a thin cloth or tissue. Reach over lens and push in on springs to release. Grille is held by two screws along rim or a single nut in the center. 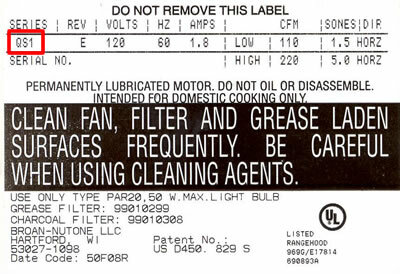 The model label is located on the underside of the motor plate. Remove light lens by pressing in on the sides and pulling down. Remove the light bulb. Remove the light reflector and grille by removing the center acorn nut. The model label is located on either the inside perimeter of housing or underside of motor plate. 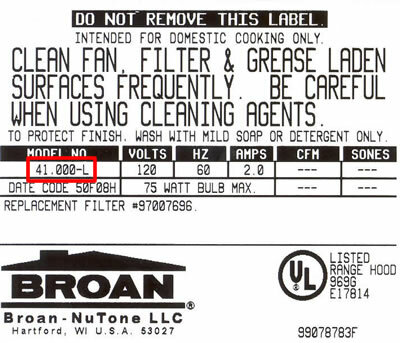 The data label is located on top corner of the unit housing. The model label is located on the cover of the wiring box which is visible from the attic. Removed the grille by a central knob or two screws. The model may be ceiling or wall mounted. 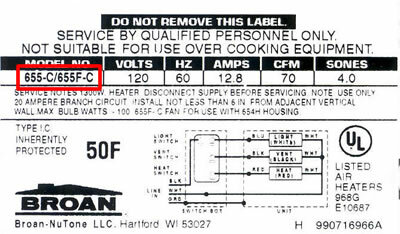 The label is located on the inside perimeter of housing opposite wiring panel. The model number is located on the bottom of the power head. The model number is located on the side of the power unit. The model number is located on the side of the unit.